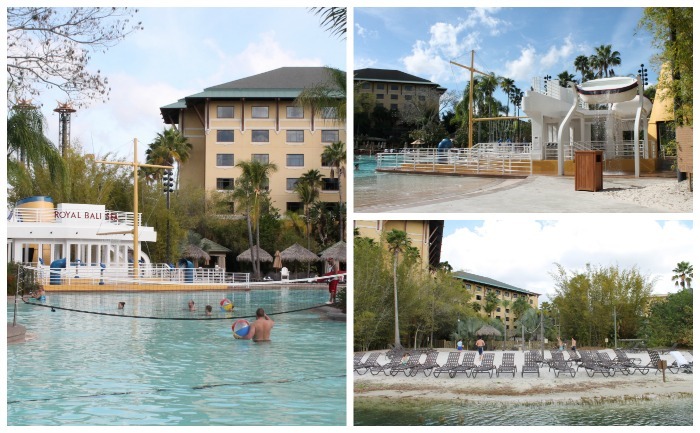 I have stayed at my fair share of hotels and resorts throughout the years, and have to say that none combine family fun with peaceful tranquility better than Loews Royal Pacific Resort at Universal Orlando. 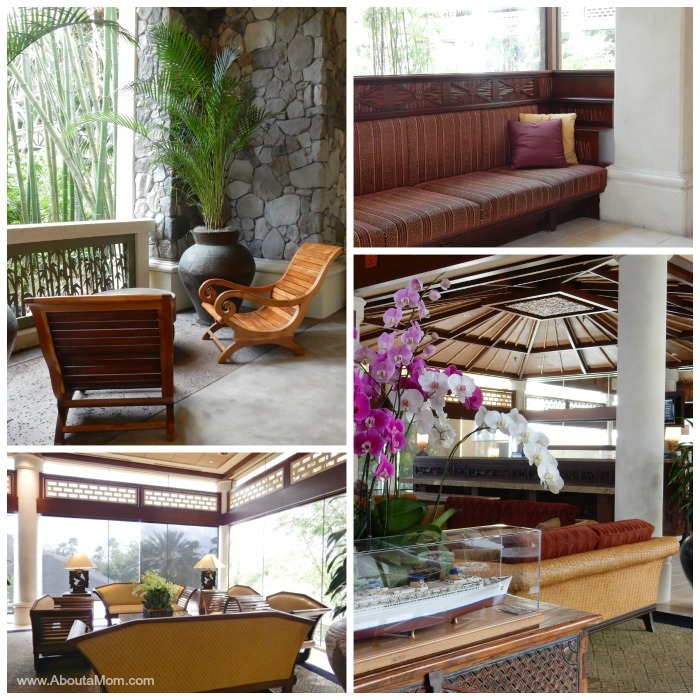 I was recently hosted by Loews Royal Pacific Resort during for a media event. During my 3 night stay at the resort, Loews Royal Pacific provided the perfect setting to rest and relax, after a fun day at the parks. As you cross over the shaded bamboo bridge into the lobby of Loews Royal Pacific, you’ll instantly begin to feel like you’ve been transported to the South Pacific. Those first steps into the resort lead you to a serene orchid and water garden courtyard where flowers are always in bloom. Featuring 1,000 rooms and suites, Loews Royal Pacific Resort infuses the spirit of ‘Aloha’ into the guest experience. 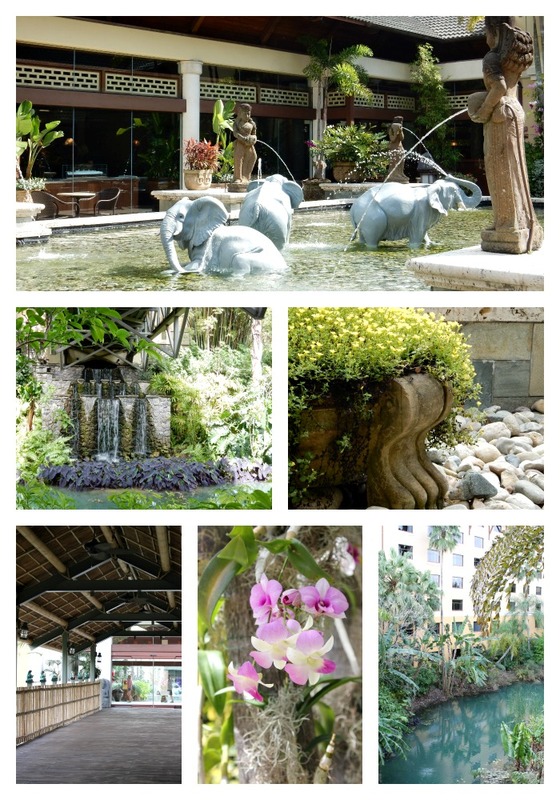 Swaying palm trees, lush landscaping, fountains and exquisite wood carvings all lend to the beauty and tranquility of the hotel. Being a person who values her quiet time, I was quite impressed with the many cozy, tucked away places where a person could enjoy a good book, get a little work done, or just listen to the fountains. Beautifully appointed guest rooms, are a relaxing oasis at the start and end of the day. A lovely orchid wall mural really set the room apart from anywhere I have stayed previously. Tech lovers and families will appreciate the functionality of the rooms which contain a large flat screen television, mini refrigerator, and an abundance of electrical outlets and USB ports. As part of its integration with Universal Orlando Resort, the hotel offers Jurassic Park-themed kids suites. These two-room suites include a room for the adults, plus a separate room for the kids featuring raptor‟s cage headboards, custom wall murals, artwork from the movies and Jurassic Park-themed furniture. Dining experiences at Loews Royal Pacific Resort include a weekly Polynesian luau, a lobby sushi bar, Pan Asian cuisine from Islands Dining Room, 24-hour room service, Bula Bar & Grille (poolside eatery) and Emeril’s Tchoup Chop. Every Sunday, Jake’s hosts a reservation character breakfast where guests can meet some of their favorite Universal Orlando characters. Since this is a family resort, child menus are available. Also, fun books with crayons to keep kids entertained at the table. The hotel’s award winning culinary team hosts a beer dinner series and two annual beer festivals, pairing select craft beers with inventive cuisine. 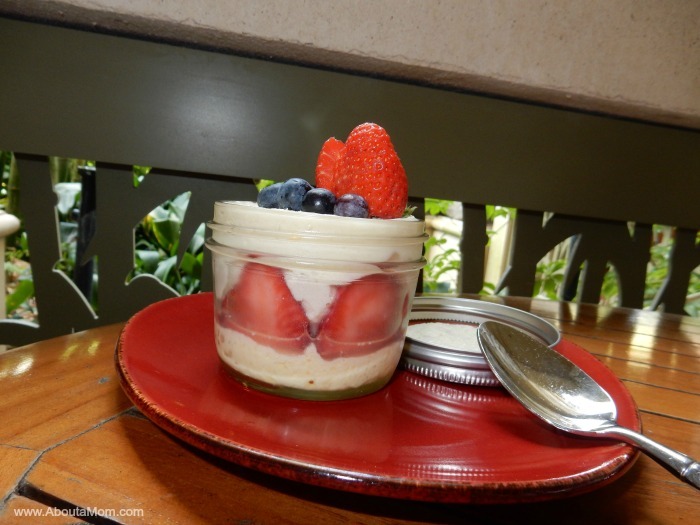 Pictured above is one of many tasty treats I enjoyed at the resort. I enjoyed this mouth-watering key lime dessert outside on the patio at Jake’s. It was divine! 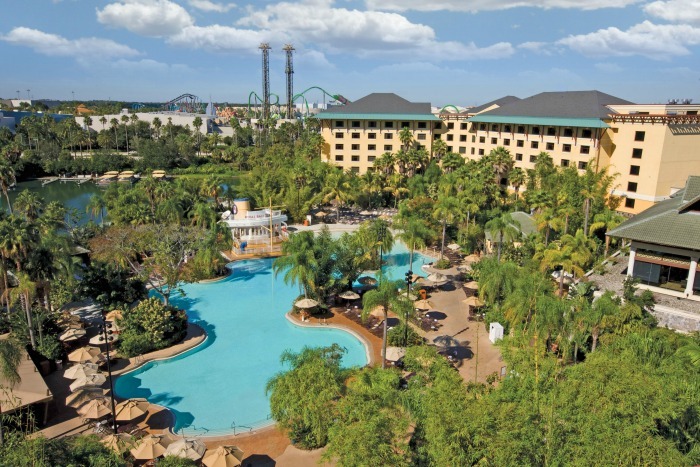 Family fun abounds at Loews Royal Pacific Resort at Universal Orlando. Despite it’s serene setting, Loews Royal Pacific Resort has loads of kid-friendly activities and amenities. The hotel’s palm tree-lined pool area features a huge lagoon-style swimming pool, hot tubs, beach volleyball and the Royal Bali Sea, an interactive water play area for children. Guests can enjoy poolside activities, divein movies, private cabanas and a poolside bar and grill. 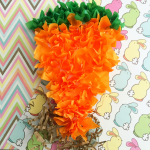 Children under 10 receive a complimentary “Loews Loved Kids” welcome gift upon arrival. For your family’s safety, child-proof kits are available for guests with children under the age of four. If you forget something at home, the resort has a “Kids Closet” with items for guests to use during their stay. These include toys, books, car seats, strollers, potty seats, night-lights, baby bathtub, baby blankets, outlet protectors, self-contained DVD players with age appropriate DVDs and more. Staying at Loews Royal Pacific Resort comes with some great perks. Free Universal Express Unlimited ride access, allowing guests to skip the regular lines on most rides and attractions at Universal Studios and Universal’s Islands of Adventure. 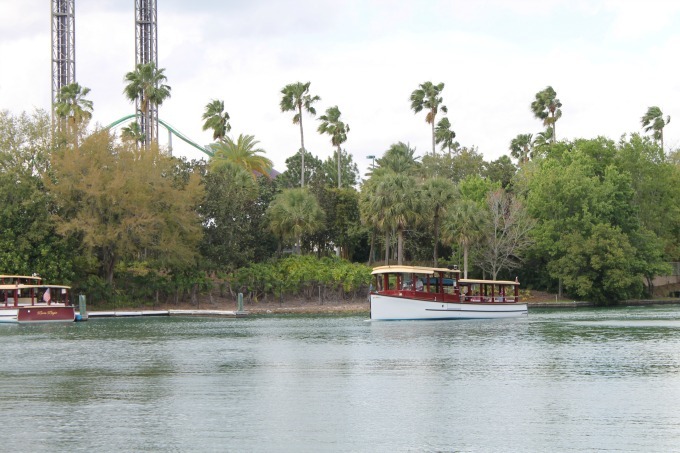 As an official Universal Studios Orlando hotel and located alongside Islands of Adventure, Loews Royal Pacific is a short water taxi ride away from both Universal Studios and Islands of Adventure theme parks and Universal City Walk. I had such a comfortable, enjoyable and relaxing stay at Loews Royal Pacific Resort! For more information and reservations, visit the Loews Royal Pacific Resort website. If you enjoyed reading this, you might also like my Universal Orlando Mardi Gras experience. *Complimentary accommodations were provided. All opinions are my own. Looks like a beautiful place to stay, I have never been to Florida I will have to keep this place in mind! If you ever get there, this would be a GREAT place to stay! This hotel is absolutely gorgeous! I loved staying there and was beyond impressed with the top notch accommodations. You two are making me want to stay there too!! I will be in Florida in a few weeks and need to check this place out. Wow. I’m not even sure I can find the right words to adequately describe how awesome this is. It’s going to Universal AND an island resort. Very cool. I love the Loews properties in Orlando. I stayed a few years ago when I went to Universal and they were AMAZING. What a stunning place to stay. Looks so tranquil! The grounds there are just so darn amazing!! I love the pool so much! Although it really is a perk, I think it’s funny that one of the perks is delivery of the merchandise to your room. Just makes it easier to spend more money and that place looks like they have a lot of cool things to get. We have actually been here and it was so much fun. In addition it was gorgeous! Oh my gosh, I’d love to stay in a place like this. I can’t wait for my next trip down to Florida! This looks like such an amazing place to stay. I love that pool. I really want to stay here. What a gorgeous place to relax. Oh man, what I would give for a weekend there! I need some time away from the routine & to relax by the pool and on a puffy, comfy bed. Wow, what an amazing place to visit. I’m slightly jealous. Talk about perfect scenery and bliss. For relaxing. It looks fabulous! How nice. This resort looks like it has it all. Thanks for sharing the amazing photographs of your stay. How beautiful! I would love to go there once day soon! What a beautiful place to stay. If I were there I would feel like I was in another world. The rooms are exquisite and the surroundings are outstanding. It’s easy to forget that there are beautiful places like this to escape to. It’s one of our favorite hotels! Such a serene atmosphere for a stay! We stayed here in October. It was one of the coziest hotels we have ever visited! 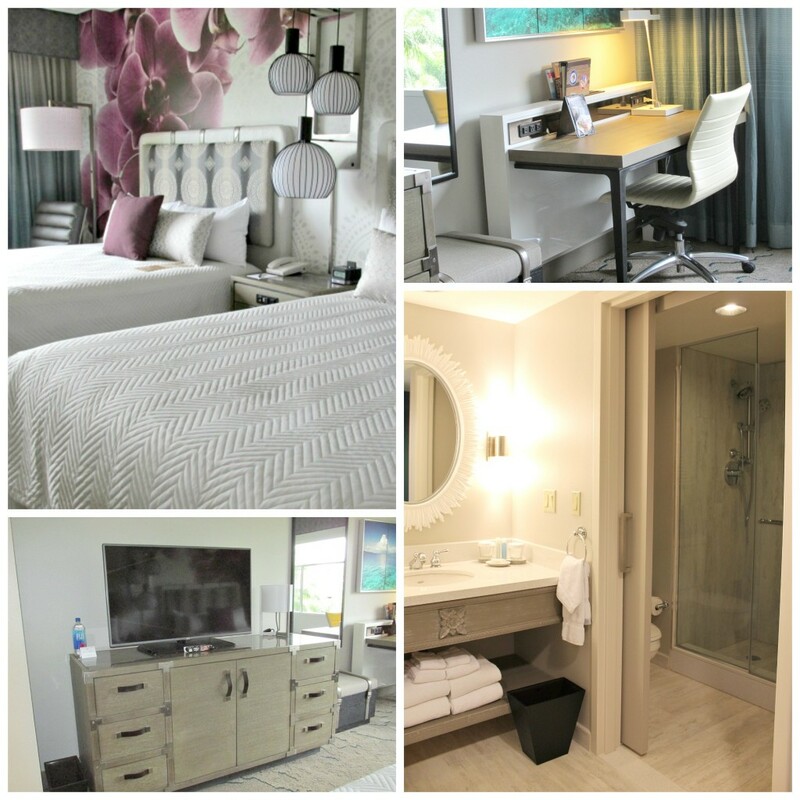 Looks like you had a truly amazing time at Loews Royal Pacific Resort @Universal Orlando. Thanks for sharing. Looks like a beautiful place to relax, eat and play for the family. This place looks amazing to visit. I love your pictures, it looks so relaxing. I am all about unique touches and I really appreciate the overabundance of towels and beautiful lanterns in the rooms at this resort. You also can not go wrong with numerous dining options and early park admission! Wow this look like an amazing resort! I love the perks and trust me that Harry Potter perk is amazing…when we went to Universal my boyfriend at the time and I went to the park an hour early too so we can be one of the first in line and it was still crowded. Its a very popular ride! This is beautiful. We are making a trip to FL this summer. 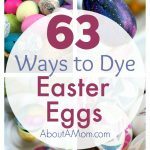 We’ll have to check this out! This is such a beautiful family destination. I would love to visit with my family. I haven’t visited Universal Orlando in a long time. I am definitely due for a visit. What a gorgeous place. I would love to be there right now. I wanna play in the water with the “elephants,” hehe. What a swanky little place to stay! This is my kind of resort. I love places that make you feel special just by being special themselves, when you’re on vacation. This looks like a great resort with lots to do. I bet you had a great time. awesome place. I will keep this one on my list for next trip. This looks like an amazing resort. I would love to spend a few weeks at Loews Royal Pacific. I love the decor. This looks stunning. I love how cozy are the rooms. It feels like home. This looks so beautiful! I would love to stay here! I love the room decors. My favorite has to bet the elephant water fountain. That is just gorgeous. What a beautiful hotel! We are heading to Universal next week, I can’t wait! What an amazing resort. I would love to go and stay there. What a beautiful place! I’ve seen quite a few postings on Universal lately & should take it all as a sign since non of them are covering the same topics. This looks so nice and relaxing! I definitely need a warm getaway! This place looks and sounds heavenly! I’ve never been to Florida, before. We hope to go during fall break, so I’ll definitely check it out! Such a wonderful resort. The pictures are so beautiful & inviting. And the guest rooms are absolutely fabulous & mind blowing which would give you so much of a relaxed mindset. What a beautiful resort!! I can’t wait to book my trip to Universal Orlando in the next year! We might have to see about staying here! I love the fountains in the photo. This looks like such a luxurious resort to visit and I like the perks that you listed. It really is such a relaxing place to stay. So fun to have visited with such a fun group of ladies! Looks like you had a blast! I would love to visit there someday. Love the pictures you took!